Hellboy Footage Blows Away the Crowd at NYCC! 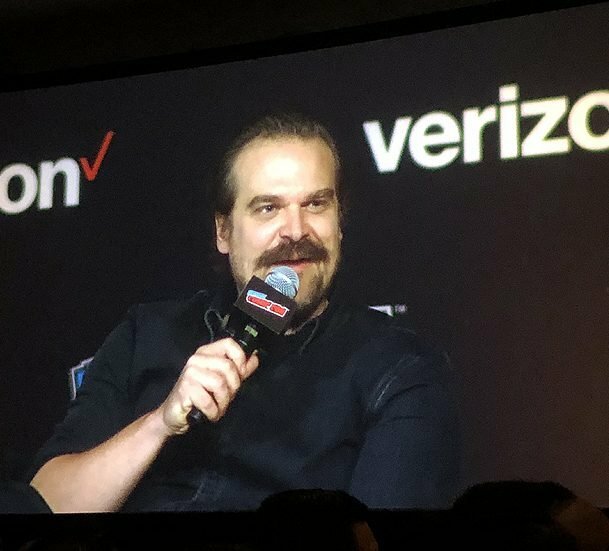 At this morning’s panel, Lionsgate showed the New York Comic Con audience the official trailer for the new Hellboy film, and cast members David Harbour (Hellboy), Sasha Lane (Alice Monaghan) and Daniel Dae Kim (Ben Daimio) as well as creator Mike Mignola were on hand. Check out a description of the Hellboy footage below, which will not be put online for a bit! “They warned us that something was coming…” says a female voice. The 2-minute Hellboy trailer opens with a shot of a London apartment building, then cuts to a huge cavernous fantasyscape, rocky with a big lake. Two tiny figures walk on one of the rocky surfaces. “If there is ever an end in this forever war… it will be because of you, and your strong right hand,” says Ian McShane’s Professor Broom in voiceover. Hellboy himself is introduced getting out of an armored vehicle in front of a museum, whereupon he immediately gets shot at by the SWAT team. “HEY! I’m on your side!” screams Hellboy. Hellboy, Alice and Ben go into a grungy fish and chips shop to get to the BPRD headquarters. “This is it?” asks Hellboy. “Expecting a sign that says secret headquarters?” replies Ben. A quant bell jingles as they walk into the shop, and an old lady behind the counter gives Hellboy a once over. “I’ll need some ID, love,” says the old lady. “Are… are you serious?” replies Hellboy. What follows is a barrage of shots set to the Idol song, including lots of monsters! There’s a fistfight with a giant practical creature twice the size of Hellboy, a house on legs in a snowy forest that Hellboy falls out of, a fiery hellscape with a skeletal bird creature flying over it, etc. “Why’d you make me a weapon?” Hellboy asks Broom. We see Alice looking sweetly at Hellboy, establishing the romantic connection between the two. There’s a beauty shot where Hellboy takes his big gun out of its case to show Alice. “Some dads get their kids LEGO’s,” Hellboy tells her. We then see a shot of him shooting a hole right through a monster’s head. “Are we saving the world or something?” Alice asks. Some snooty guy in a restaurant asks Hellboy if his Right Hand of Doom does anything special. “It smashes things real good,” Hellboy replies. We then see a scene of him in an elevator, he punches the buttons and the elevator drops. “I thought we were supposed to be fighting monsters, not working with them,” says the facially-scarred Ben. “Who you calling a monster, pal? You look in the mirror, Scarface?” replies Hellboy. “Sorry… did I interrupt?” Hellboy asks her. “On the contrary, you’re just in time,” replies The Blood Queen. 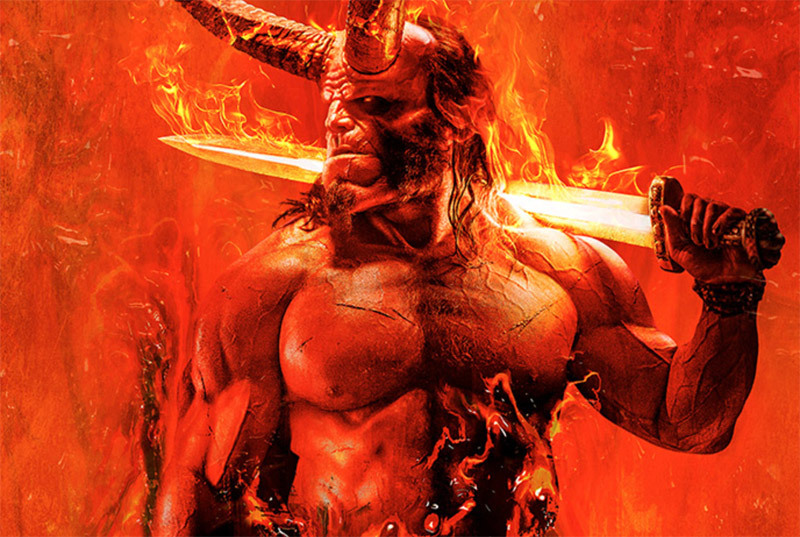 The trailer ends with Hellboy emerging on a platform rocking the long horns and a flaming sword. Overall the trailer had a fun, splashy comic book feel blended with director Neil Marshall’s more British flavor of comedy. Fans of the character should not be disappointed! While the new Hellboy freely adapts Mike Mignola’s “The Wild Hunt,” the comic creator has a few ideas he’d like to see if another sequel happens. Harbour also had a huge surprise for ComingSoon.net specifically, as site editor Spencer Perry and his fiancé Carly Lane had asked the actor on Twitter if he could officiate their wedding in March. Harbour gave a shout-out to Carly and eventually went onto Twitter and announced that he will perform the wedding in FULL HELLBOY MAKE-UP if his tweet gets 666K retweets. 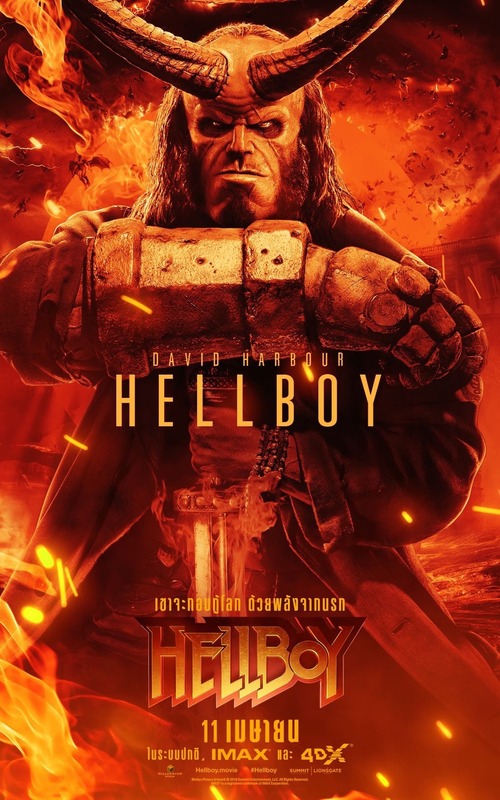 Based on the acclaimed graphic novels by Mike Mignola, the story centers around Hellboy (David Harbour), who is caught between the worlds of the supernatural and human and battles an ancient sorceress bent on revenge. David Harbour stars as the title character in the upcoming film and is joined by Ian McShane (Deadwood, American Gods) who will play Hellboy’s adoptive father, Professor Trevor Bruttenholm (aka Professor Broom), Milla Jovovich (The Fifth Element, Resident Evil franchise) as villain Nimue aka the Blood Queen, Sasha Lane (American Honey) will play Alice Monaghan, Penelope Mitchell (Hemlock Grove) will play the elder witch Ganeida, and Daniel Dae Kim (Hawaii Five-0, LOST) is playing Major Ben Daimio. Neil Marshall (The Descent, Game of Thrones) will direct from a script by Andrew Cosby (Eureka), Christopher Golden and the character’s creator, Mike Mignola. Larry Gordon and Lloyd Levin will produce with Mike Richardson of Dark Horse Entertainment. Hellboy is set to open on April 12, 2019.